After the Netherlands formally recognised Indonesia’s sovereignty in 1949, the young republic went through a long period of internal restructuring. President Sukarno, at the top of the new government, slowly brought the country towards what he called a “guided democracy”. During those chaotic times, Indonesia was the site of numerous conflicts of interests involving major geopolitical issues. Suite à la fin de la Revolusi et la proclamation de l’Indépendance, le pays connaît plusieurs mouvements insurrectionnels. De nombreuses révoltes accompagnent la venue au pouvoir de Soekarno dans certaines régions indonésiennes comme Sulawesi ou Sumatra. Vite réprimées, elles donnent la possibilité au nouveau président d’imposer l’ordre. Certains conflits vont s’étendre dans le temps, comme celui de la province d’Aceh, au nord de Sumatra. Finalement, celle-ci finira par obtenir un statut spécial lui conférant une certaine autonomie par rapport au reste du pays. 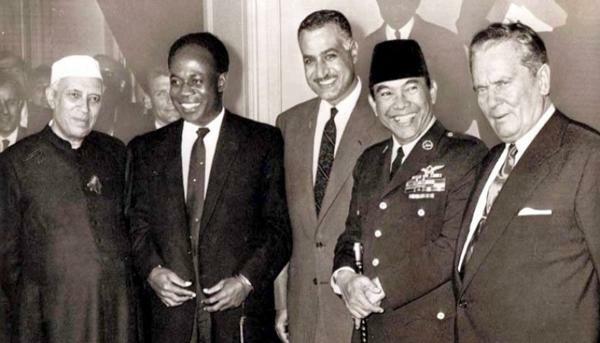 n the midst of the Cold War, Indonesia hosted the Bandung Conference (1955) which eventually led to the establishment of the non-aligned movement. The historical meeting was attended by leaders of Third World nations like Zhou Enlai, Nehru and Nasser. Together, they refused to side with any of two cold war blocks; USA with NATO and the Soviet block. Decisions made during this summit reinforced the international decolonization process and facilitated the emergence of new forces facing the USA and USSR. Starting in the 1960’s, Indonesia went to war with neighbouring countries over territorial delimitations. Relations with Malaysia deteriorated over the control of Borneo island. The policy of Konfrontasi led Indonesia to violently oppose the British whom they accused of endangering the country’s sovereignty. The Malaysia-Indonesia war ended in 1966 with the division of Borneo in three parts: the Indonesian territory called Kalimantan, a smaller part under the Malay authority and Brunei as a tiny independent state. At the eastern extremity of the archipelago, the status of Papua in New-Guinea had been pending since the Independence. It was controlled by the Netherlands although Indonesia claimed it as part of the republic. The United States made a final decision in 1962 and granted Indonesia the annexation of Papua. In the meantime, pushed by the rise of the Indonesian Communist Party (PKI), Soekarno started showing sympathy towards the Soviet block. Thereby, Indonesia undertook diplomatic relations with Asian countries aligned to USSR such as China, Vietnam, Cambodia and North Korea. The United States feared the emergence of a new conflict in Southeast Asia. 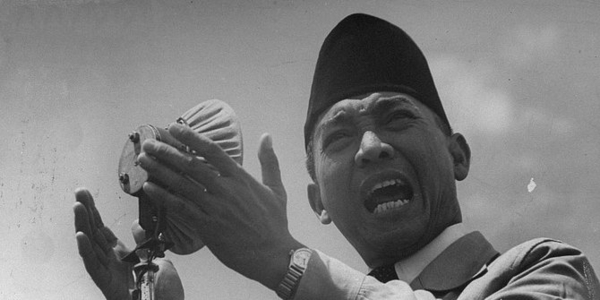 Suharto’s coup d’etat in October 1965 marked a new turn in the history of the nation. The internal political turmoil forced the nation to review its international priorities. The social purge that characterized the change of power was the beginning a thirty-two-year dictatorship.